Forrest Booth focuses his practice in insurance and reinsurance with particular emphasis on the defense of claims and disputes, litigation, admiralty and maritime claims, insurance coverage, marine insurance, oil and gas and energy matters. He has substantial knowledge and experience in cases involving personal injuries, collisions, cargo damage, oil pollution, charter parties, maritime contract disputes, pilotage, marine insurance coverage, mediation, ship building and ship repair, vessel arrest, product liability, property damage, construction defect, oil industry indemnity agreements, breach of contract, marine salvage, maritime fraud, stevedoring, cargo subrogation and commercial and oil and gas energy matters. 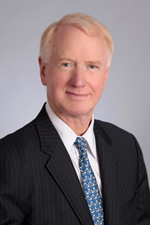 Mr. Booth also advises and counsels his clients on matters of commercial general liability. Prior to joining Hinshaw & Culbertson LLP in March 2015, Mr. Booth was for nine years a partner at an insurance boutique firm in San Francisco. He was a partner at a number of other San Francisco firms, including having been a founder and senior partner of his own firm in the 1990s. He began his career in at a firm in Washington, D.C.
Mr. Booth served his country as a Lieutenant in the United States Navy from 1968–1972. "No Sailing Blind: Weather Services Help Avoid Storms," The Maritime Executive, July 15. 2016.